Preschool Learning Kits is a funny way learning apps for your toddler learn the basics such as Letters, Numbers, Colors, and Memory Match. 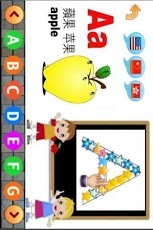 Let your toddler learning English, Mandarin Chinese and Cantonese (Hong Kong) at the same time! EveryKidsApps Preschool Learning Kits is developed by who is father and mother of the kids, thus they’re know how to helping toddlers getting ready for school. Preschool Learning Apps includes hundreds of high quality graphics, images, sounds and animations, With Preschool Learning Kits, your child will be involved, happy and learning. Kids can touch on the letters, number, color as well as objects to hear related sounds in English, Mandarin and Cantonese. Early childhood is a time of wonder, openness, insatiable curiosity, and immense parental influence. Preschool Essentials Application plays a crucial role in this first step. ✔ Learn Letter Sounds. Kids touch the letter block will hear the ABC phonics being pronounced. ✔ Letters: Letters of alphabet with letter sound and a sample object for each letter. ✔Learning the correct way to write letters and numbers. ✔Memory Match Game: This is a basic matching game where your child will match up the fruit. There are 12 cards total that need to be turned over. Keywords: Kids, ABC, ABCs, Letters, Reading, Educational, Children, Games, Preschool, Preschool-aged, Color, Shapes, Count, Math.